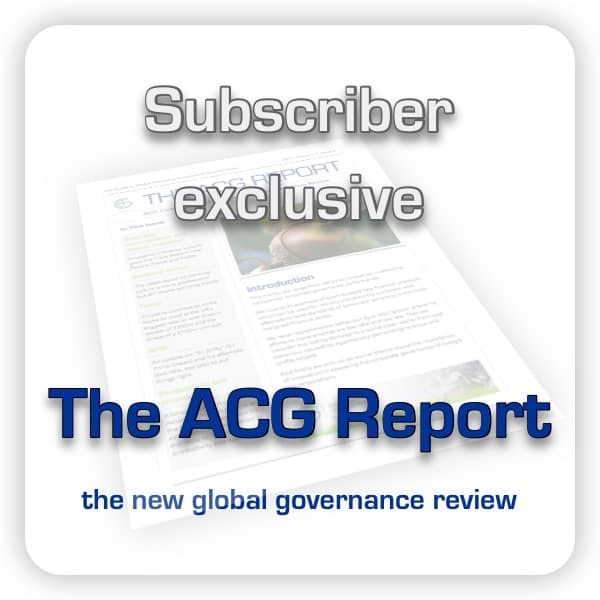 Why do we have to take corporate governance seriously? The creators of this website have spent many years espousing the importance of corporate governance, as authors, lecturers and consultants. Even before the issue came to the forefront of business with the Cadbury Committee following the Maxwell pensions scandal, we recognised that it was not actually a new concept at all. As long as there has been large-scale trade people have recognised the importance of corporate governance – that is, responsibility in the handling of money and the conduct of commercial activities. We discuss the history of corporate governance and the definition of corporate governance in other areas of the website. The issue of integrity: are the boards and management of companies carrying out their duties in an ethical way (we define business ethics here)? Topicality – the bonus culture: could better corporate governance in financial institutions and their remuneration policies have prevented the credit crunch and resulting financial crisis? Perception is in the eye of the beholder, and corporate governance, while a technical term for accountants, lawyers and the like, is known by the readers of the popular newspapers by names such as honesty, decency, fairness. Similarly, what the professional would call questionable practice in this arena is criticised by the general public using words such as rip-off, cheating and crooked. The central issue today therefore in the field of corporate governance is not whether most listed companies comply with the various provisions of the Combined Code, Sarbanes-Oxley, King, etc. The key point is whether the top management of large organisations especially, but actually of that of business in general, is seen as possessed of integrity in the eyes of the general public. This is the spirit that gave support to the principle of setting up the Cadbury Committee, not simply a desire to lay down some rules on the financial aspects of corporate governance to prevent innocent fund managers being misled by greedy directors. And it is this integrity – perceived and actual – which underlines the importance of corporate governance, as it is the tool by which integrity can be encouraged, measured and projected. The current financial crisis has brought into sharp focus the system of bonuses and remuneration operated by financial institutions. It is argued that it encouraged excessive risk taking and irresponsible lending. Combined with the complex financial instruments that the mainstream institutions constructed to move the risk off their books, this – highly simplistically stated – was, some say, what led to the so called ‘credit crunch’. What is certainly true is that there was excessive risk and irresponsible lending and this led to the downfall of some of the world’s biggest lenders and in turn the insurers insuring that risk. We strongly believe that our approach, which is different to the conventional, box ticking mechanisms, would have succeeded as it is not only places corporate governance and business ethics at the core of the organisation not as a separate issue, but is based on independent market research. This is covered in our corporate governance and research section. Directors’ pay and the bonus culture are often seized upon by special interest groups and the media as a single issue, not in the context of business and society as a whole, and is therefore blinkered to the underlying factors causing and affecting remuneration. While the latter is an obvious manifestation of good or bad governance (if only because it exposes the quality of stakeholder communication! ), it misses the basic point that companies should be run well and responsibly – in every way, not simply in how they pay salaries and bonuses. In a well run company, good performance is rewarded and rightly so – to attract talent and people dedicated to improving performance, not simply doing a job. In its Principles of Corporate Governance, the OECD acknowledges that: “Good corporate governance should provide proper incentives for the board and management to pursue objectives that are in the interests of the company and its shareholders and should facilitate effective monitoring.” Clearly, it is not in the best interests of the company for it to go out of business or be bailed out by governments. So it is not the principle that should be debated here, but the implementation. As we said earlier, while the board, management – and even the shareholders – may feel that remuneration is fair, it is clear that current corporate policy is not in line with public perception. In the US this is perhaps more evident than in more reserved UK society if the internet searches are anything to go by – Wordtracker, the keyword research tool, reports nearly 8,500 searches over the last year relating to the AIG bonus payouts alone, the vast majority including the word ‘outrage’. So in spite of the bonus culture being hijacked at times to attack business generally, the issue does highlight the importance of corporate governance and the need to assess the quality of the system of checks and balances in all sizes of company (bearing in mind many of the “toxic mortgages” were sold by small local brokers). As we argue elsewhere, the importance of corporate governance could be restated as the importance of good management. Put in that simple way it seems obvious, but we see instances daily of a lack of recognition that good governance is actually just good management and a failure of governance is a failure of management. Awarding bank and insurance company bosses generous bonuses and pension packages after government bailouts of failing institutions, apart from being a huge public relations gaff is rewarding poor management and hence poor management itself. But while reform is clearly needed, a knee-jerk reaction will always result in building a sledge hammer to miss a nut. The regulators have openly admitted that they did not understand the complex financial instruments that ultimately folded in on themselves and led to the collapse of the financial system. Constructing new regulations to try to control circumstances that have yet to emerge – every crisis has different causes – is a futile task. Restricting the range of products available to address the problem has major implications on innovation and consumer choice. Some of the knock-on effects of this are that products become more expensive; large providers will not take on certain sectors of society because they are not profitable; and niche providers providing those innovative products will cease to operate or be closed down by the regulators. That clearly represents a significant backward step in the financial services market. The importance of corporate governance in the financial markets is particularly topical but the solution to bad governance is universal and any system of regulation needs to strike the right balance between encouraging innovation and customer choice and enforcing a minimum set of standards. Fundamentally, though, it should provide the incentives to go far beyond these minimum standards and try to demonstrate that, by changing the corporate culture, the long term rewards are actually greater (not least because it should result in less regulation!) Just as punitive tax regimes encourage evasion, avoidance or relocation, it has been proven that the regulatory burden, while in many cases adding cost and confusion, has caused people to invent more and more complex systems to avoid detection. There is, of course, much excellent regulation which has indeed improved the consumers’ lot by forcing companies to disclose information, reduce costs/charges and generally act in a fair manner. We need to build on those good aspects and not simply impose more box ticking exercises. A corollary to the focus on corporate behaviour and the behaviour of senior corporate employees is the attention increaseingly being paid to the qualification of these senior people to carry out their responsibilities. There has never been any formal qualification required to run an organisation, and none to be a director – although in recent years organisations like the UK Institute of Directors has introduced qualifications such as the Chartered Director to address the issue. In practice, of course, most large and well run organisations will look for suitable professional qualifications in their senior staff, and there is an increasing number of organisations offering non-executive director training and selection services. In the last ten years or so, especially following the dot com boom and bust and the collapse of Enron and WorldCom, the role of direction has finally begun to be seen as a profession or at least a discipline requiring specific training and development. It is clear that it is the importance of corporate governance has been a major influence here and the IoD qualifications specifically mention corporate governance as a significant element – and benefit. To make a real difference long term, it should start much earlier in professional development, and corporate governance is starting to filter down, with some MBA courses, especially in Australia, offering it as part or all of the course content (though the latter has the potential to persist the notion of corporate governance being a separate issue, which as you will realise by now, we think it wrong. Others, such as the London Business School, include modules on ethics and Corporate Social Responsibility. It is our sincerest hope that this trend continues and that the true importance of corporate governance is fully recognised and acted upon.